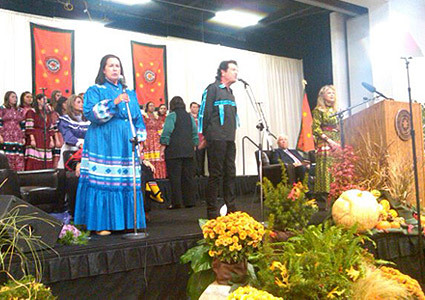 Becky Hobbs, Duane Sciacqua, mezzo-soprano Barbara McAlister, flutest Tonya Russell, and the Cherokee National Youth Choir perform TSA LA GI – WE ARE MANY (written by Becky) at the Inauguration of Principal Chief of the Cherokee Nation, Bill John Baker, on Nov. 6, 2011 in Tahlequah, Oklahoma. 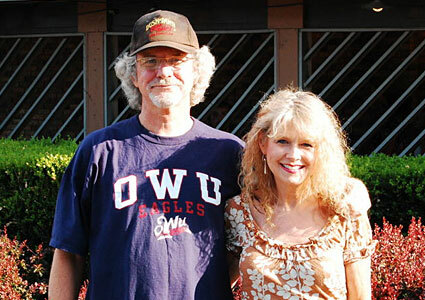 Bill John Baker is a fellow Nancy Ward descendant. 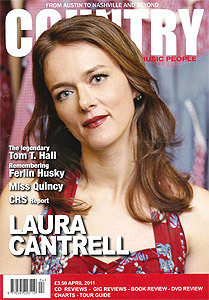 U.K.'s Country Music People, the #1 magazine for international country music news. Becky and Duane performed at the Cherokee Heritage Center Grounds in Tahlequah, OK to celebrate the 58th Cherokee National Holiday. After a rousing country music show, interspersed with songs from NANYEHI, the Beckaroo invited up friends, including opera singer Barbara McAlister, to join in singing "Tsa La Gi We Are Many." They got a standing ovation. 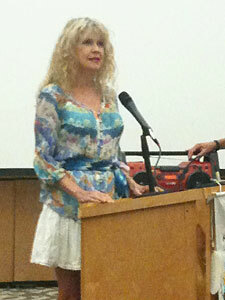 Becky sings “Let There Be Peace” at the Association of the Descendants of Nancy Ward meeting in Tahlequah. At the end of the meeting, Duane joins her in singing “Tsa La Gi We Are Many,” and a resolution was made by the Association of Descendants, to propose legislation to make “Tsa La Gi We Are Many” the official National Anthem of the Cherokee Nation! 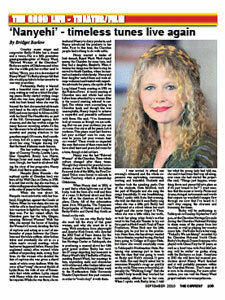 NANYEHI and Becky Hobbs have a full-page article in the Sept. issue of THE CURRENT magazine, page 105. Writer Bridget Barlow attended one of the workshops at NSU and interviewed several of the participating students, as well as Becky and Nick. The Current is widely read in NE Oklahoma, and NW Arkansas. Becky plays in her hometown, Bartlesville, Oklahoma to benefit CONCERN Charity, an organization that supplies a food pantry, day-care, and other services to needy families and individuals. 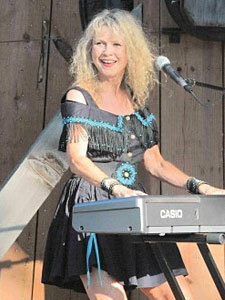 She shared the stage with the Nellie Johnstone, the first commercial oil well in what is now the state of Oklahoma. Even the 96 degree weather didn't stop the Beckaroo from rockin' at the keys. 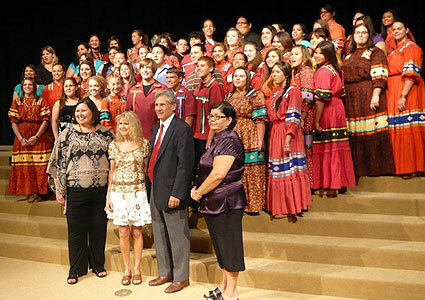 L to R: Mary Kay Henderson, Youth Choir Director; Becky; Cherokee Nation Chief Chad Smith; & Kathy Sierra, Cherokee National Youth Choir. Becky's song, "Tsa La Gi We Are Many" is performed by the Cherokee National Youth Choir, celebrating their 10th Anniversary, and the release of their new album, "Now and Then." The song is included on the album. Becky was invited up to talk about how she wrote the song. 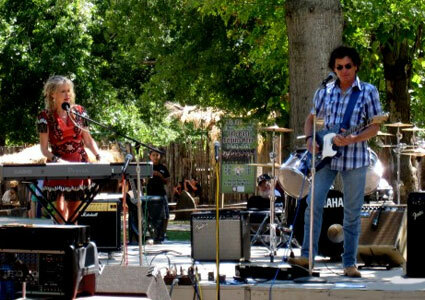 Front row L to R: Mike Remy, Lucy Stambaugh, & Trey Clark. 2nd row L to R: Siota Mulford, Jennie Pletsch, Nick Sweet, Chris Miller (NSU Playwriting & Screenwriting Instructor), & Becky Hobbs. 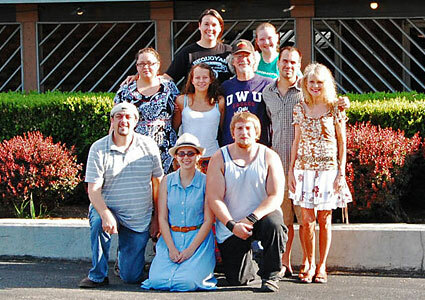 3rd row L to R: Robyn Pursley (Instructor & Coordinator of Theatre for NSU) & Danielle Clark. Becky and co-playwright, Nick Sweet, complete a three-week workshop at NSU for NANYEHI, under the direction of Robyn Pursley. 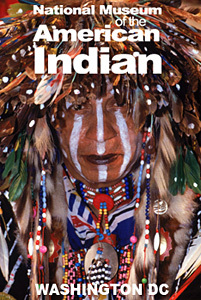 NANYEHI-BELOVED WOMAN OF THE CHEROKEE is one of eight recipients of the 2010 Visual and Expressive Arts Program Awards of the Smithsonian’s National Museum of the American Indian. The museum's award program offers support to a wide range of arts activities with the goal of increasing knowledge, understanding and appreciation of contemporary Native American arts. 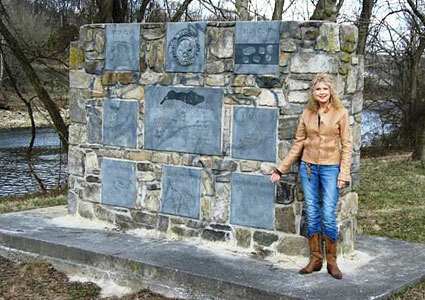 Picture caption: Becky Hobbs, 5th-great granddaughter of Nancy Ward, Beloved Woman of the Cherokee, stands at the Cherokee Monument at Long Island, Tennessee, where Nancy gave her plea for peace in 1781. The monument depicts the Seven Clans of the Cherokee and the Seal of the Cherokee Nation.